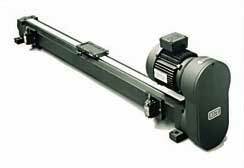 The RACO LM Linear module is the building block for both single axis or multiple axis systems. The carriage travels on adjustable roller bearings surrounded by a shock absorbing elastomer tire, driven by a steel cord reinforced timing belt with zero backlash . The RACO LM drives are designed for high speeds and long travel (stroke) with medium side load capabilities that are found frequently in today's process automation. The RACO LT2060 Linear Drive is designed for heavy loads at moderate speeds. The carriage is supported by moving on slides. This actuator is Belt, ACME or Ball Screw driven and can accommodate heavy duty applications that are closely related to the capabilities of the RACO MA Rod Type Electric Actuator, but with a much longer stroke capability.